The European Humanist Federation (EHF) calls on Irish voters to vote “yes” at the upcoming referendum on removing the wording condemning blasphemy from the Irish Constitution. 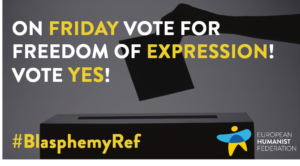 This Friday’s referendum will decide whether to remove blasphemy from the list of limitations of freedom of expression. This will then pave the way to removing blasphemy as a criminal offense from the country’s Defamation Act of 2009. Freedom of Expression is one of the foundations of our modern pluralistic societies where a diversity of opinions can coexist. While it can be legitimately limited in certain specific cases, such as incitement to hatred or violence, laws penalizing blasphemy always go beyond such limitations. The EHF opposes blasphemy laws. While we promote respect, we hold the view that the right to Freedom of Religion or Belief does not include the right to have a religion or a belief that is free from criticism or ridicule. In practice, “blasphemy laws” constrain free expression when it comes to asking questions, offering of criticism, and expressing satire or ridicule, in relation to religion. Repealing them liberates freedom of expression without in any way undermining people’s right to believe or practice their religion. Still today, in Europe, blasphemy laws are in force in more than half a dozen countries and in some of these, they are still being actively used. For example, in Greece, blogger Philippos Louizos risked being sentenced to ten months of prison for having “dared” making a pun on a Greek monk’s name on social media. Similarly, last month Spanish actor Willy Toledo was summoned by a court for having offended religious sentiments in a Facebook post. Globally, repressive regimes use blasphemy laws to silence any criticism of the state religion. In some countries, offences are punishable by death. These regimes often refer to still existing blasphemy laws to justify their oppressive policies. If Europe is to strengthen its voice as a region striving to foster human rights, mutual understanding and peaceful co-existence in the world, it first has to remove its own laws undermining freedom. Irish voters have an historic opportunity to contribute to that by voting Yes on Friday.